The model is completely UV-mapped and smoothable, made with 3ds Max 2011 and V-Ray 2.40. 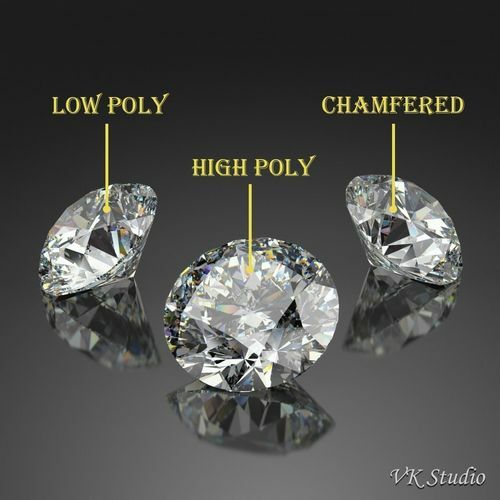 Photo-realistic 3D model of Round Diamond, Brilliant Faceting, Ideal Cut. This model of diamond presents so-called ideal cut, mathematically calculated shape and proportions of brilliant faceting, which guarantee that light rays will not pass through the diamond but will reflect from its inner facets multiple times. The result of this are beautiful refractions with a lot of rainbow dispersion, that makes diamonds so pleasant to look at. Since the model provides precise proportions of ideal cut and accurate parameters of diamond material, the resulting renderings are the most life-like possible. Note, that all renderings of the model were made in absolutely neutral black and white studio environment. No colorful HDRI maps or colored lights were used. Also, the renderings are provided as is, without any post-processing, enhancements and after effects. NURBS GEOMETRY - the initial design of the model in a CAD program using NURBS shapes. Best for using in jewelry CAD designs. LOW POLY - polygonal topology with minimal number of polygons retaining the diamond's shape. Best for low-poly applications and scenes, where diamonds are placed far from the camera. Not for subdivision. HIGH POLY - polygonal topology with number of polygons enough to present the roundness of the diamond's girdle. Best for scenes, where group of diamonds is the main subject. Also this topology is good for the render engines having option to chamfer edges at rendering time. Not for subdivision. CHAMFERED - polygonal topology with chamfered edges and round girdle. This topology is the most realistic presentation of real diamond, though in the cost of polygonal budget. Best for the scenes with extreme closeups of the diamond. For better result, the subdivision level 2 or higher is recommended for this topology renderings. Model provides level of details enough for close-up renders. Objects, groups, materials, textures in a scene have unique and meaningful names. Model has real world scale (system units - centimeters). Model is completely ready for visualization. Each mesh is put in a separate file. Model previews were rendered in 3DS Max with V-Ray renderer. Studio lighting setup is not included.